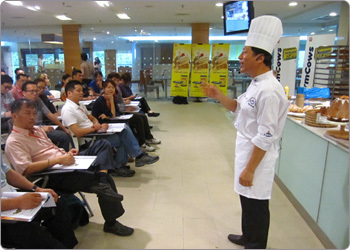 LSEO invited more than 50 bakery customers from Malaysia, Singapore, Brunei, Myanmar, Hong Kong and China for a Korean Bakery Delicacies Workshop held at our Senai Complex, Johor on 25 September 2013. 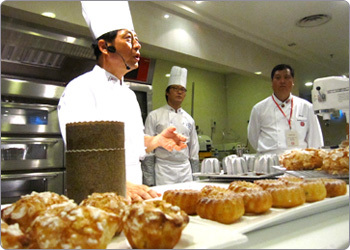 The 1-day workshop was conducted by Mr Ungil Kim, a renowned master baker from South Korea. He is the president of a bakery-ingredients trading company known as Bakeplus Ltd., which is one of our export agents. Mr Ungil Kim is a certified master baker with more than 40 years of experience in the bakery markets of Korea and Australia, and throughout his career he had conducted thousands of similar baking workshops. At the workshop, Mr Ungil Kim introduced our Butterol Fat Spread, the main ingredient, and used it to bake 5 types of European breads. Butterol Fat Spread is the same product which Bakeplus Ltd. has been distributing in Korea for many years. However, it is known as Compound Butter in compliance with the Korean Food Regulation. Prior to the commencement of the workshop, Mr YH Siew, General Manager (Export), gave a presentation on the company’s profile and our product range of premium bakery margarines, including Butterol Fat Spread to all the participants. The group also toured the Senai Distribution Centre as part of the event programme.